The community HOA says they are saving to purchase new lights for the area. JOHNSON COUNTY, Ind. 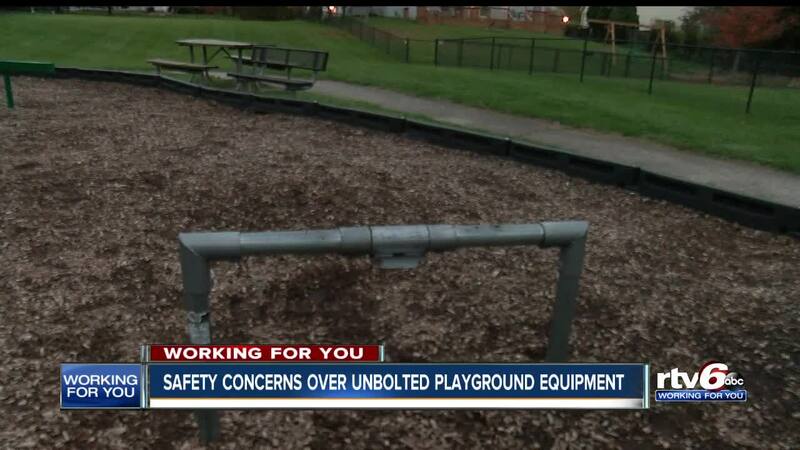 -- Parents in White River Township are concerned after someone unbolted the playground equipment in a neighborhood park. Kim Duffie, President of the Wakefield Homeowners Association says the playground equipment in their neighborhood park area is only about three years old and this isn't the first time they've had issues with vandalism. "We have a lot of little kids here now, so we don't want the kids to get hurt," said Duffie. Duffie says the HOA is looking into ways to improve the safety of their neighborhood and deter vandals from causing more damage. "We are saving up some money to buy some more lights for here in the park and we're also going to put some nice lights on the walking path," said Duffie. "To help keep the kids out and make people feel safe if they don't want to walk." She says once the new lights are installed, they will probably stay on until around 10 p.m. If you have any information about the vandalism, contact your local police department.